A global study by Citrix and the Ponemon Institute has highlighted global trends in IT security risks and reasons why security practices and policies need to evolve, finding technology is all too often outdated. The report found 98 per cent of business respondents reporting they will spend over a million dollars in 2017 for security. However, the study states, many of the systems and people in place are still not able to handle today’s threats. 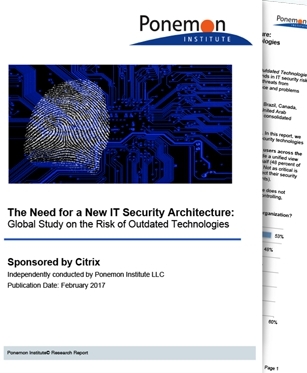 The report, “The Need for a New IT Security Architecture: Global Study”, also found that less than half (48 per cent) of survey respondents said their organization has security policies in place to ensure employees and third parties only have the appropriate access to sensitive business information. Not helping is that nearly 70 per cent of business respondents said that some of their existing security solutions are outdated and inadequate. • Most IT professionals in Canada (73%) feel strongly that some of their security solutions were outdated and inadequate. In fact, Canada is among the top four countries to agree that their organizations’ existing security solutions are outdated and inadequate. • 71% of IT and IT security practitioners say their organization needs a new IT security framework to improve its security posture and reduce risk. • More than any other country, Canadian IT practitioners think that machine learning is the most important technology to reduce security risk over the next two years (85%). • Talent pool is small. Survey respondents also shared their ideas for solutions and improvements. The report features insights from more than 4,200 IT and IT security practitioners in Canada, Australia/New Zealand, Brazil, China, Germany, France, India, Japan, Korea, Mexico, Netherlands, United Arab Emirates, United Kingdom and the United States.